Today, the Kennon family, direct descendents of the Coopers, run the Coopertown ORIGINAL Airboat Tours. The Coopertown Airboat fleet. consists of seven airboats in operation, the largest airboat has a seating capacity of 24 people. The smaller two-seater has been hired for movie and documentary filming and fashion photo shoots for clients from all over the world. More than 60 years later, the same exciting airboat tour is given with experienced, well-trained and informative everglades airboat guides. For some, it is a completely new and different experience. For the tourist who come back year after year and the local people who bring their friends and family along, it is always fun and educational. Originally a Seminole Indian Village occupied by Jimmy Osceola and the other simple living Seminole Indians, Coopertown was founded by John Cooper and has remained with the Cooper family since. Originally from White Oak, Missouri where they came from a large farming family, the three Cooper brothers came to the Tamiami Trail from Melbourne, Florida, looking for better frog hunting in the Everglades. 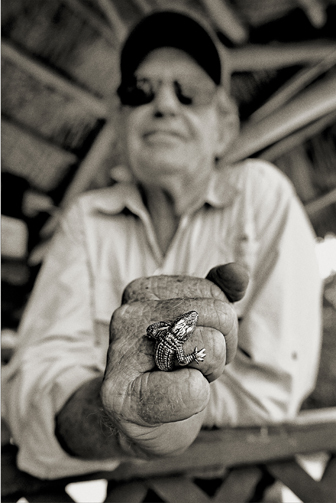 By 1945, John Cooper had a small frogging boat along the East-West Canal (the Tamiami Trail). Passing motorists noticed it and would ask for a ride in the interesting looking airboat. John obliged. At first it was a few people, but as more and more curious people stopped, John built a small passenger airboat to accommodate them. As the traffic down the Tamiami Trail grew, so did Coopertown. John’s brother James T. (Jay) built and opened a Bait & Tackle shop along with a grocery store and gas station. In April, 1967, Edward Williams purchased Jay’s Bait & Tackle and then sold it to the National Park in June of 1996. John’s brother Marion opened a small stand, serving sodas, sandwiches and fresh ‘Glades frog legs to the Airboat Tour passengers. Over the years, the stand grew into the Coopertown Restaurant under various local management. In June, 1967, Ellen Curtis leased the establishment and has promoted the now “world-famous” house specialty, Everglades Frog Legs – the platter or the dinner version, if you prefer. Or try the tender nuggets of gator tail. Of course, other “down-home” meals are served, as well as the “best hamburgers in town”! See what else the Coopertown Restaurant has to offer! The Coopertown Guest Book is filled with names of people who have visited our Everglades home from all over the world including many notables and celebrities, such as Dennis Weaver, Doris Day, Bobby Breen, Robert Fuller, Burt Reynolds, Dana Andrews, Clint and Ronnie Howard and their Dad, Rance Howard and Andy White, producer of the series “Gentle Ben”. Country singers Ferlin Husky, Slim Whitman and Bobby Lewis. Baseball heroes Micky Mantle and Billy Martin, and football players Jake Scott, Bill Stanfill and Bob Kuechenberg. Other famous names to visit Coopertown include Chuck Norris, Kurt Russell, Mariel Hemingway, Raul Julia and Beverly D’Angelo. We look forward to seeing your name too! We, the residents of Coopertown, hope you have enjoyed your virtual visit to “Beautiful Downtown Coopertown” and we hope you will come and visit us, join us for a private airboat tour to see the real thing soon!